All the library's LEGO® bricks at your beck and call to build to your heart's content. If that wasn't enough we will also be showing a LEGO® themed movie to energize your building skills. Our Saturday movies are great for kids and families. We're pleased to offer a free showing of a movie that is of interest to grown-ups on varying Mondays of the month. Check out our Monday Matinee page for more information. “Do you really know why you think the way you do?" Robert Brust PE, SE, is a structural engineer who has worked on some of the country’s more well-known buildings. Brust began his lengthy search for human understanding after a tragedy: his son died, causing him to reexamine all of his assumptions about how best to live. What he learned, from looking at problem solving and life from an analytical way – from an engineer’s perspective is the premise for his book. Sponsored by The Friends of the Library. Copies of David’s books will be available for purchase and signing. Joan & Bette Bette & Joan Written by and Starring Jillann Gabrielle | 4th Tuesday Forum on the 5th Tuesday! 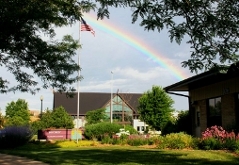 Co-hosted by the DeForest Area Historical Society, the Center, and the Library. This library outreach program is open to the community.